Asphalt shingles are the most popular roof covering for homes, largely because they are relatively inexpensive, are durable, and come in a wide variety of styles, colors, and textures. Here at Pro Home 1, we carry three-tab shingles and architectural shingles from leading manufacturers to give your home a long-lasting beautiful finish. 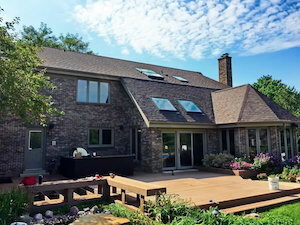 We are your local asphalt roofing expert serving Schaumburg, Wood Dale, Mount Prospect and many areas of Illinois. Call us at 1-844-801-2465 or click below to schedule your roof inspection and get a no-cost, no-obligation roofing estimate. Our trained, experienced roofers make sure that each shingle is nailed down properly to prevent blow-offs and roof leaks. In addition to asphalt shingle installation and repair, we also service a wide variety of roofing materials and can handle all types of roof repair, new roof installation and re-roofing jobs. Contact us today for a free estimate for the roofing services you need. We proudly serve Arlington Heights, Des Plaines, Wheaton, Palatine, Lombard , Naperville, Elmhurst and nearby towns and cities.